The new facilities will help support the work of officers across Hampshire. 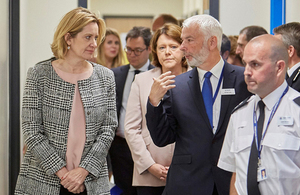 Home Secretary Amber Rudd has officially opened a new Police Investigation Centre (PIC) to serve the northern area of Hampshire. The centre forms part of the police force’s plans for modern facilities to help support the work of officers across Hampshire. Police officers and staff in Hampshire and across the country do a fantastic job keeping us all safe. Crimes traditionally measured by the independent survey for England and Wales have fallen by more than a third since 2010. I am really pleased to open the new investigation centre in Basingstoke because by having modern facilities in the right locations means more officers’ time is spent where it matters most – on the frontline, doing vital work to reduce crime in our communities. The building integrates an investigation hub and custody suite, to drive more efficient and effective working for police officers and staff, especially around the investigation of detainees. The time saved will ensure arresting officers can return to active policing of the community more quickly. I am delighted that the Home Secretary saw first-hand why we all think the opening of this building is a cause of celebration, recognising the delivery of a building that serves our communities through excellent design, build and function. It provides the best of professional working environments supporting police staff and victims, witnesses, and our partners; as well as creating opportunities for savings through greater efficiency.